MEASURE Evaluation helps at global and country levels to strengthen health information systems (HIS) by applying innovative health informatics tools and processes. Its applications in health include telemedicine, electronic medical records, health information systems with decision support, mHealth, data warehousing, and eLearning tools. 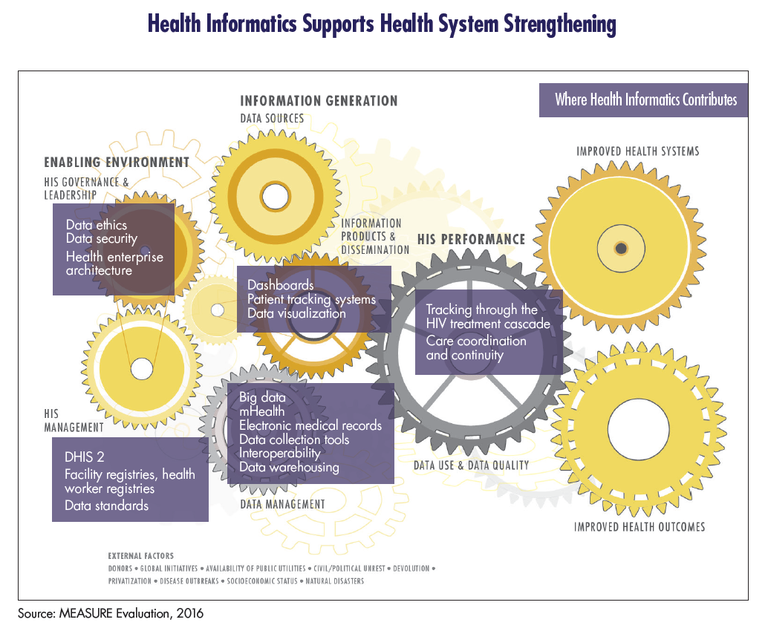 Health informatics makes the right information available to the right people—within and without an organization—at the right time and place, and for the right price. We collaborate with stakeholders and solicit strong input from countries to develop or adapt standards that make it possible for datasets to become interoperable, thereby creating a wide array of shared data that decision makers can rely on to improve health services. We use health informatics to create platforms for electronic data sharing, which makes timely data available to people who need them to make informed decisions. We create data analytics and visualization capabilities for existing information systems, including district health management systems in low-resource countries (chiefly, the DHIS 2 platform). These capabilities increase the utility of health data by aggregating them to illustrate overall trends, while retaining the capacity to disaggregate them to identify specific health needs at specific locations and facilities. Data ethics is at the core of our work. We create guidelines, build capacity and systems that uphold the confidentiality of patient information, reduce gender bias, and reduce incidence of stigma, through control of how identifying information is recorded, transferred, stored, and accessed. We develop systems that are patient-centered. That means that information systems should enhance care by tracking patients through their treatment progress. For example, as HIV-infected patients move through the progress of antiretroviral therapy (ART), patient-centered systems enable better patient-to-provider communication, track drug supply inventory, and improve data management and overall patient management. These systems enhance the effectiveness of the test, treat, and retain approach that is a focus of the U.S. President’s Emergency Plan for AIDS Relief (PEPFAR). We ease the burden of frontline healthcare workers by supporting countries to gradually migrate from paper-based systems to strong and secure electronic systems for more efficient, real-time (or near-real-time) reporting, particularly in rural and peri-urban low-resource areas. We develop better data collection systems, using information technology solutions and standardized procedures, so that health outcomes can be monitored, data is collected more accurately, and quality checks are conducted routinely—especially at the data source points, such as healthcare facilities. Better data collection enables decision making based on quality data to improve health interventions. We work with in-country and international partners in finding solutions to new problems for harnessing information and communication technologies that reinforce health information systems and hold promise to improve patient experience and health outcomes.